The Axis Ofir Beach Resort hotel, which has been recently renovated in 2016 is situated near the beach of Ofir and very close to the city centre. Located in Esposende, a well-known tourist area in the North of Portugal, this hotel will be our leisure and working place during next year’s Euromeeting. Thanks to its privileged location and the existence of optimal motorways a wide range of cities of great cultural and scenery interest will be accessible for us. This hotel has many features, it offers high quality services, free Internet connection, manifold leisure and entertainment possibilities, tennis court, pool tables, bowling alley, among others, night shows as well as its large facilities and a garden of more than 2,000 square metres where will will spend unforgettable moments. SUNDAY 28th. Check-in from 12.00h. Half-board (supper) in the hotel. Documentation delivery upon arrival.20.00h. Evening: Euromeeting presentation. Welcoming cocktail and supper. We will head to the city of PORTO, located along the estuary of Douro River. It is the second largest city in Portugal after Lisbon. It is located on the right bank of the Douro, by its mouth in the Atlantic Ocean in Northern Portugal. It is known for its trading activity and its modern contrasts between the old town, surrounded by narrow streets and old alleys and the modern area. Porto is an ancient city which has a wide historical heritage; although during the last decades it underwent an extensive modernization. Porto’s metro network, which does not just cover the city centre, but also some areas of its metropolitan area, such as Senhora da Hora or Maia, is the largest in Portugal. We will visit the university quarter, the Torre dos Clérigos (Clerics Tower); which is Portugal’s highest bell tower, the Douro docks, the praça da Liberdade, the dock of Ribeira (The district of Ribeira is one of the most important spots in Porto’s old town). As its very name indicates, it is the area located along the river bank. Its colorful and decorated façades attract all visitors’ attention, as much as those ones facing the Douro River and reflect in it (we can get a better look of them from Vila Nova de Gaia, on the opposite river bank), as the ones being part of the streets labyrinth which compose the district of Ribeira, the Palácio da Bolsa (Stock Exchange Palace), the Church of São Francisco, the cathedral. We will head to the area of the Douro Ribeira. We will reach Casa de Mateus, in Vila Real where we will visit the Mateus Palace. Then we will visit Quinta da Pacheca, we will let ourselves shroud in the aroma and taste of the Ribeira wines and we will also taste a Port wine. 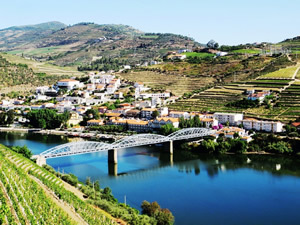 We will then set off for the town of Lamego, where we will visit the Sanctuary of our Lady of the Remedies and we will head back to Porto following the river bank to enjoy one of the world’s most beautiful landscapes, the wine región of Alto Douro, which has been declared World Heritage Site by the UNESCO. Bus transfer to Viana do Castelo, a town in northern Portugal with a strong liaison with the sea due to its role played in the Portuguese discoveries and in the cod fishing tradition. Surrounded by green hills and located along the estuary of the Lima river, its surroundings offer mountains, waterfalls and chapels marking the path to Santiago de Compostela. We could highlight its churches and convents, its Misericordia church with its emblazoned façade and the Chafariz, both dating back to the 16th century, as well as the former town hall. Not too far is the Romanesque Cathedral or Main Church to be found. We will finally go back to the hotel. BARCELOS is a small town known for its handicrafts and its weekly open-air market. Color, activity, hustle and bustle and culture are words which define Barcelos, a town located in the Minho region, in northern Portugal. Barcelos has achieved to perfectly combine tradition with innovation and modernity. This town offers a unique beauty, and we will discover in its streets the history and the art which have always played an active role in it. This is where the legend of the famous rooster started, one of the icons of this country. After a short visit we will carry on towards Guimarães, another Portuguese town whose old town has been declared World Heritage Site by the UNESCO. Guimarães’s most characteristic monument is the medieval castle, which dates back to the 10th century, and the Palace of the Dukes of Braganza from the 15th century, which nowadays serves as a museum. We will let ourselves be enchanted by the medieval atmosphere breathed in Rua de Santa Maria and in the whole town. After visiting the beautiful place we will head back to the hotel. 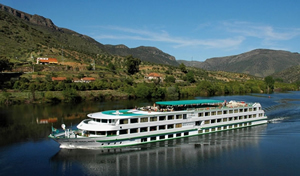 We will set out for PORTO to enjoy an approximately 1-hour-long cruise along the Douro River (Cruzeiro das 6 Pontes). The Douro, a guardian river known for its flavors, traditions and wine offers some landscapes which are a visit worth. We will sail under the six bridges on board a typical boat und we will admire the old town and its typical houses and the hustle and bustle of the people of the district of Ribeira. After disembarking we will go to Vila Nova de Gaia for a visit to a wine cellar (Ferreira, Sandeman or Offley) and then a magnificent dinner with a Portuguese typical show will be awaiting us. The dinner as well as the night show will take place in the restaurant Herança Magna. We will finally go back to the hotel. We will drive to BRAGA, also known as the “Portuguese Rome” for its churches. It is an old city in the northwest of Portugal. Its history and its livelihood are linked to the Christianity since the 3rd century. The Sé (Cathedral) of the city, which dates back to the 12th century is still one of the most popular tourist attractions. Right outside the boundaries of the city lays the well-known pilgrimage sanctuary Bom Jesus de Monte, with its impressive baroque staircase. After sunset this stoic city becomes one with a thriving night life thanks to its many university students. We will also visit the Cathedral from the 12th century, the Chapel of the Relics and the gardens of Santa Barbara, in the city centre. We will go to the sanctuary of Bom Jesús do Monte, we will walk across its gardens, which have 14 baroque steps. The first stretches in zigzag make up a Via Sacra (Sacred Road), with 14 chapels showing the stages of the crucifixion of Christ. We will finally visit the sanctuary of Sameiro, Portugal’s second largest one after Fatima’s. BASIC INSURANCE of assistance on arrival INCLUDED (Policy at your disposal). If you wish to contract an optional trip insurance, please ask the travel agency. Airport-hotel and vice versa transfers: 25, 00€ (Porto), per go and return journey and person (prices based on a minimum of 30 people). PRICES: The trip prices have been calculated according to the currency exchange, fares, fuels, fees and VAT in force in Spain and Portugal as of 01/08/15. Any change in the mentioned fee can be revised and passed on the customer according to the current legislation, and the general conditions included in this offer and attachments (Article 157 RDL 1/2007).